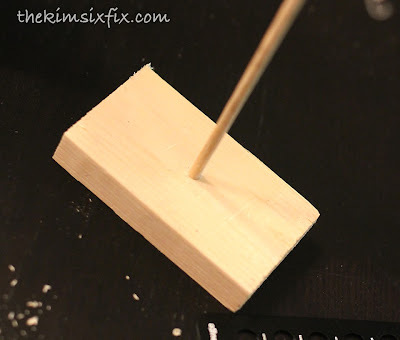 I promise you, this is going to be the easiest tutorial I have ever published on this blog. In fact, it was so easy I almost thought about not even posting it, but then I reconsidered. 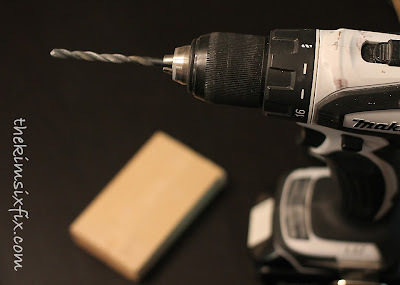 If you have never used a drill, this is the best starter project I can think of. You will learn to use your drill, how to select the correct drill bit as well as how to make a nice straight hole. And if you screw up, oh well! Try again. There is nothing on the line. First you have to find your victim willing volunteer. 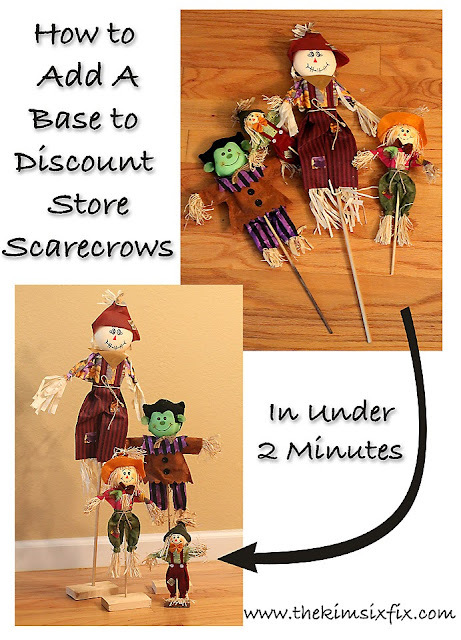 In my case I had a little 12 inch scarecrow from the Target dollar bin. 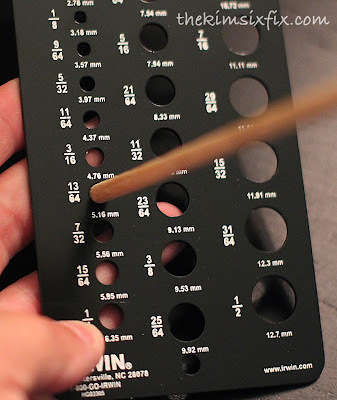 The next thing you need is a drill gauge. This is a great tool. It is one of things, besides the drill itself, that I use most when doing simple projects. If you don't have one, get one. 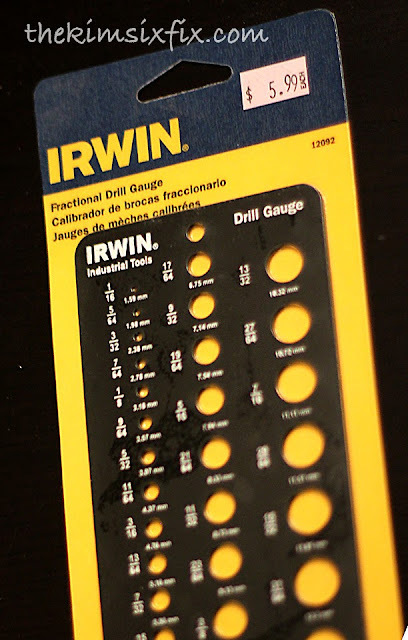 (My dad actually got me my first drill gauge when I got my first drill, and I thought I would never use it. I was wrong. Father knows best!) They are pretty hard to find. The big box stores don't carry them. I recently lost mine and had to get one at a specialty tool shop.. but luckily you can find them online. 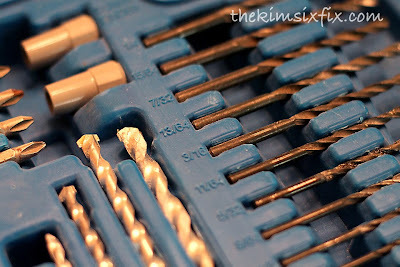 You use a drill gauge for identifying the correct size drill bit you will need for a certian size hole. 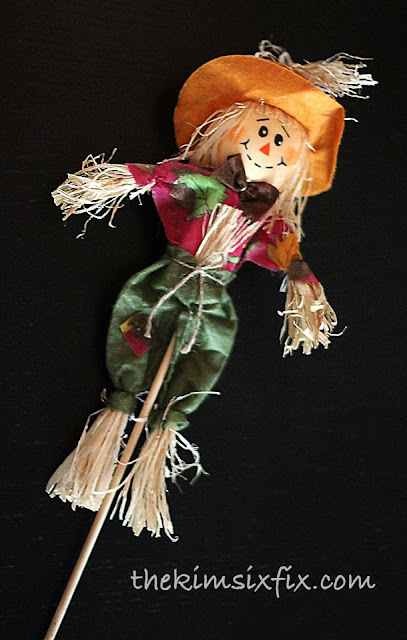 In this case, I want to make a hole the exact size of the dowel on my scarecrow.. In the image you can see my down is 13/64ths of an inch. So that is the size drill bit I will need to use. 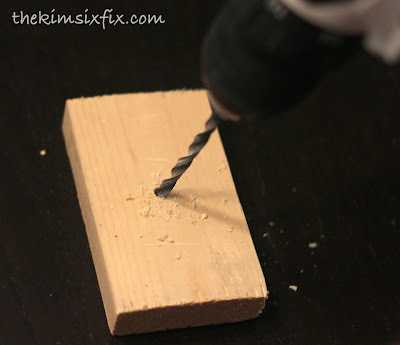 Once you have your drill bit installed in your drill, you will need a block of wood. Pretty much any size, width, shape will do. 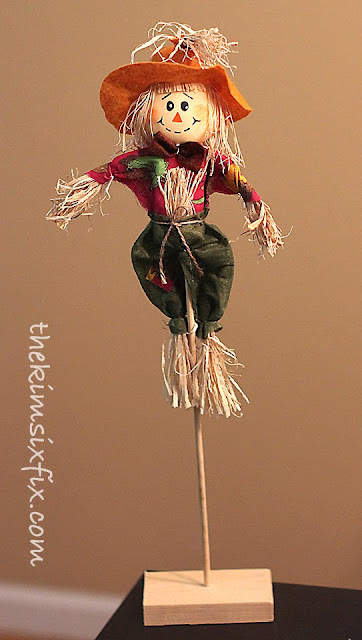 (The bigger the scarecrow, the bigger the base obviously.) But they are pretty light and don't need much support. My block was about 3.5 inches by 2 inches. Just a scrap. Put the bit right in the center of the block, and pull the trigger. (Make sure your drill is in the "forward" setting.. drilling clockwise!) You want to go in as straight up and down as possible or else the little guy will be leaning! I am showing the block sitting on my dining room table.. Don't do that. You don't want a hole in your table. When I got into the block I moved it onto a piece of scrap wood! Ta-dahh!! 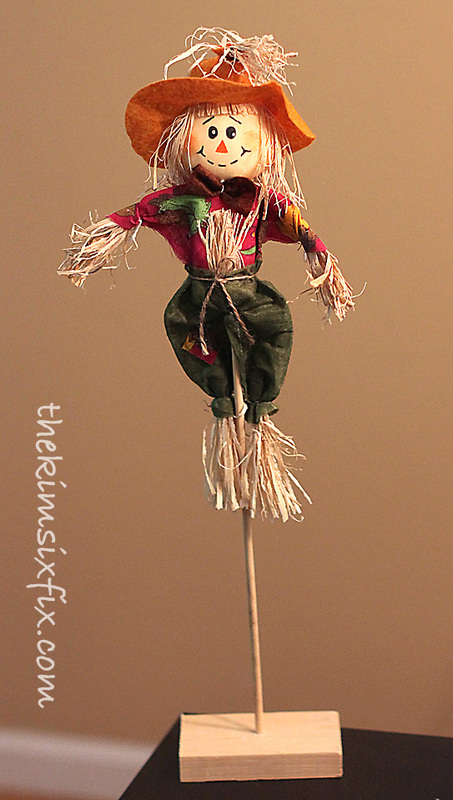 Freestanding Scarecrow! Perfect decoration if you don't want to stick him in the ground (and in case you have any crows that need scaring). If I find the time I will share at some of these fun parties! Oh that's the perfect solution! I have some of those decorations that I haven't use that much cause is a pain to stick them in the ground!